Kelle Jolly and Faith Morris sit down with Todd Steed to talk about the joys of staging the Women In Jazz Jam Festival. Kelle Jolly is the founder and organizer of the festival, which is celebrating its fourth year. She explained that she believes the biggest hurdle women have to pass through in music as opposed to men is networking, branching out and finding work, so this festival was a way to help with that. “I started the festival because even groundhogs have a day, and I feel like women in jazz needed to have a platform where they were celebrated. They needed a platform where they can be inspired and a place where they can collect and get to know each other,” Jolly said. I first wrote about the festival and about Kelle in 2016 when the festival was an idea floating around in her mind. Two successful outings later, the event has taken on a life of its own, shifting a bit in form and format each year, but keeping the focus squarely on women in jazz. There couldn’t be a brighter light to guide it than Kelle. She’s an inspiration and that’s what the festival has become. Women in Jazz Jam headliner Diane Monroe embraces musical freedom. KELLE JOLLY SANG THE BLUES WHILE BETHANY HANKINS COAXED THE LONESOME NOTES THAT ACCOMPANIED HER OUT OF A VIOLIN MADE BY KELVIN SCOTT. These three music makers represent just a small segment of the performers and creators who make up Knoxville’s music scene. It’s a scene as diverse and rich as the music it creates. It encompasses Appalachian fiddlers, classical performers, jazz and blues men and women, country crooners, a maker of fine instruments and those who build and repair amplifiers. 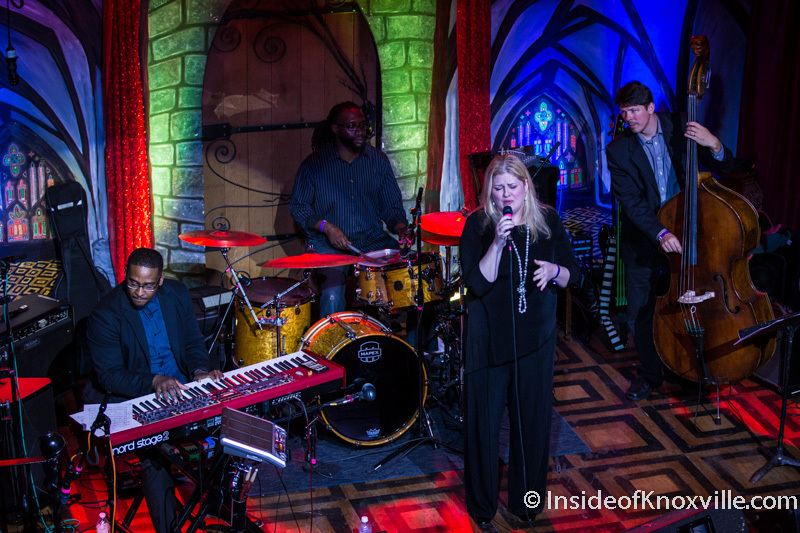 Jazz fans rejoice, because the Women In Jazz Jam Festival returns to downtown Knoxville March 16h and 17th! This will be the event’s third year, and it’s shaping up to be a good one. The Women in Jazz Jam Festival will be Friday-Sunday, March 18-20, in locations around town. Festival organizer Kelle Jolly has put together a weekend of concerts and activities to celebrate women composers and musicians. The very name of the event tells the story. The Women in Jazz Jam Festival reigns queen.